Home / Scottish Brick and Tile Industry / Wishaw Fire Clay Works, Wishaw, North Lanarkshire. Wishaw Fire Clay Works, Wishaw, North Lanarkshire. William Hudspith & Co,Wishaw Fire Clay Works, Wishaw, North Lanarkshire. 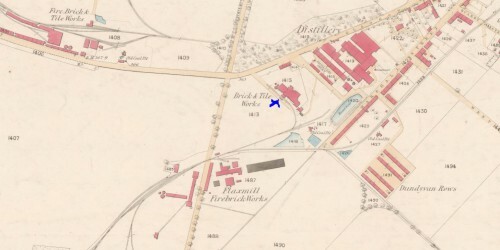 Below – 1859 – The blue cross marks the Hudspith brickworks. 29/06/1865 – Glasgow Herald – Highland and Agrictural Society of Scotland. Half yearly meeting. 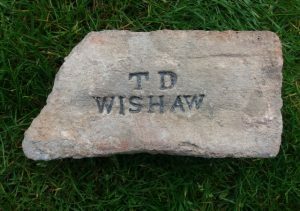 New members included…William Hudspith, Wishaw Brickworks, Wishaw. 12/08/1865 – Hamilton Advertiser – W.Hudspith & Co ( successors to Thos Dean) Manufacturers of agricultural drain pipes, common composition and fire bricks, composition pipes, plain and fawcett vitrified sewage pipes, horse mangers, cattle troughs, vent linings, chimney cans, garden edging, furnace blocks and every description of plain and fancy clay goods. Agents for Scotland to make and sell Foxley’s patent beaded bricks for garden walls. All orders promptly attended to. Wishaw and Berry Hill Brick , Tile , Fire Clay and Sewage Pipe Works. Below – 03/10/1865 – Cumberland and Westmorland Advertiser – William Hudspith manufacturer of vitrified Fireclay, pig and cattle troughs, horse mangers, stable bricks, water troughs, sewage pipes, taps, sinks and every description of plain and ornamental goods in fire clay. South Tyne Works, Haltwhistle. Wishaw Tiles from 1 inch to 18 inches diameter. W. Huspith & Co are prepared to deliver these superior tiles in quantities from 3000 to 3000000 at any principal Station in Cumberland or Westmorland. Wishaw and Berry Hill Works by Motherwell. N.B. (Note – SBH – I believe the Brryhill brickworks is another name for Hudspiths Wishaw works. See the 1896 map below – just to the South West of the works there is mention of the Berryhill Rows). 19/01/1866 – Edinburgh Evening Courant – Reference to Mr William Hudspeth, brick and tile manufacturer, Wishaw being involved in a committee trying to improve the North British Railway extension around Wishaw. Below – 1867 – Advert – W Hudspith & Co, Wishaw, Motherwell. 31/07/1867 – Glasgow Herald – Highland and Agricultural Society Show, Glasgow – At stand 75, a display of fire-clay from the works of Hudspith & Co, Wishaw. The application of the material in question to drain and sewage pipes, pig and cattle troughs, and ornamental flower stands is illustrated in a number of excellent specimens. The flower stands, designed after the similitude of old tree stumps, struck us as particularly successful. 1868 – William Hudspeth & Co, Wishaw Pottery and Brick Work, Motherwell. 13/08/1870 – Falkirk Herald – Man Found Drowned.—About nine o’clock, Wednesday morning the body of a man was found in a pond near Hudspith’s brickwork, Berryhill Rows. The body has since been identified as that of collier named Owen Garry, residing in Brown Street, Wishaw, who had not been seen or heard since Saturday afternoon last, when he left his lodging. 27/07/1871 – Glasgow Herald – Highland and Agricultural Society Show at Perth – Messrs Hudspith & Co., Wishaw and Haltwhistle, show a large and excellent assortment of fern and flower arboretes, and also a variety of articles in fireclay – dipping sheep troughs, irrigation tiles, and sanitary pipes, fitted with plain and faucet pipes. 26/07/1875 – Glasgow Herald – Firebrick moulder wanted. One accustomed to working with brass moulds also 2 or 3 good pipe makers. 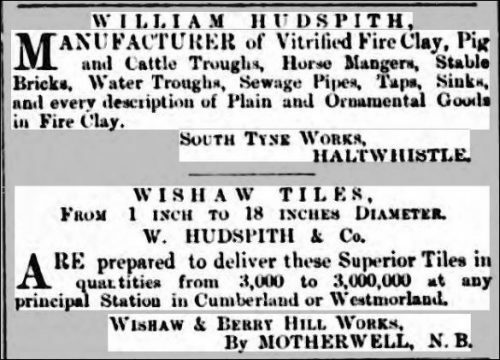 Apply to William Hudspith & Co, Fireclay Works, Wishaw. 1877 – 1878 – Leslie, Thomas, agent for Wm. 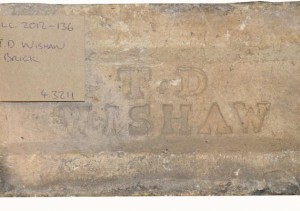 Hudspith & Co., Wishaw and Haltwhistle Brick Tile, and Fire Clay Works. 1879 – 1880 – Leslie, Thomas, agent for Wm. 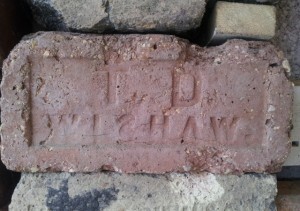 Hudspith & Co., Wishaw and Haltwhistle Brick Tile, and Fire Clay Works. 1880 – 1881 – Leslie, Thomas, agent for Wm. Hudspith & Co., Wishaw and Haltwhistle Brick Tile, and Fire Clay Works. 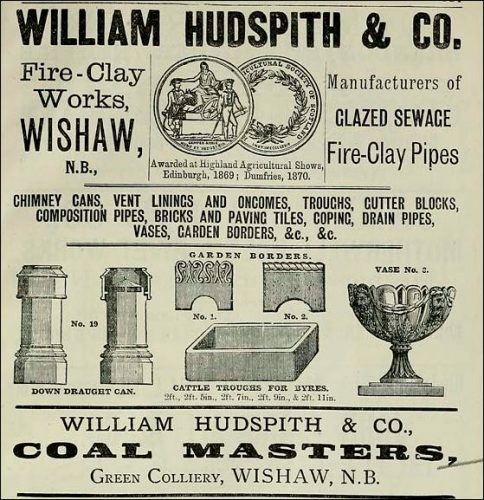 Below – 1882 -William Hudspith & Co, Fire clays, Wishaw. Coal masters, Green Colliery Wishaw. 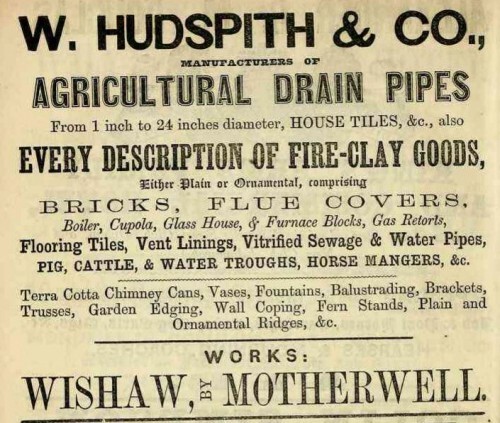 1885 – Hudspith William & Co. Fire Clay Works, Wishaw. 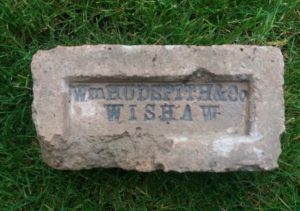 1886 – Hudspith William & Co. Brickmaker, Wishaw. 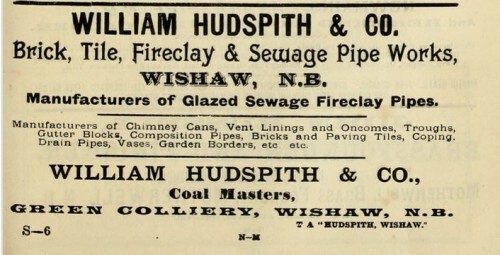 Below – 1886 – William Hudspith & Co.
1889 – Hudspith William & Co. Fire Clay Works, Wishaw, N.B. 1893 – William Hudspith & Co, Brick and Tile and Fireclay Manufacturer, Glasgow Road. 1893 – Messers W Hudspith’s brick and fireclay works – Started more than half a century ago, these works passed through many hands and it was not until 1864 that the present firm entered into possession of them. Messrs Hudspith & Co manufacture fireclay goods of almost every description including chimney cans, troughs, glazed pipes, coping, vases, garden borders etc besides bricks of various kinds. 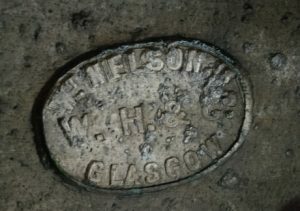 The fireclay is obtained from the firms Green Colliery adjoining Wishaw South Station. Below – 1893 – Advert – William Hudspith. 27/09/1895 – Edinburgh Gazette – I, John Hamilton Buchannan MD. Sowerby, Thirsk, Yorkshire hereby intimate that I have sold and assigned my interest in the Firm of William Hudspith & Co, Coalmasters and Brick and Tile Manufacturers, Wishaw, in the County of Lanark, to William Hudspith and James Riddell, the remaining Partners. The said William Hudspith and James Riddell will receive all debts due to, and pay all debts due by, the said Firm. John H Buchannan..
12/02/1900 – Carbarns Colliery is the properly of Messrs William Hudspith & Co., and is situated near Cam’nethan Old Graveyard; in fact it was known at one time as the Old Graveyard Pit. 3 die in pit explosion. 28/11/1902 – Hamilton Herald – Death of William Hudspith (23/11/1902) – The late Ex Baillie Hudspith – On Wednesday the grave closed over the mortal remains of the late ex-Bailie Hudspith. who died at his residence at Haltwhistle, Northumberland , on Sunday, at the ripe old age of 77. The deceased gentleman, who at one time played an important part in local affairs, was born at Cowbarn Farm, near Haltwhistle in 1825. Brought up in that district, he came to Wishaw in 1861 as one of the partners of William Hudspith & Co, who had acquired the Wishaw Fire Clay Work, from the representatives of the late Thomas Dean. Mr Hudspith during his stay in Wishaw, was well known in Scottish business circles. He also took a considerable and active interest in public affairs being a member of the local Commission Board and afterwards one of the Baillies. In politics he was an ardent Liberal, and a loyal supporter of Major, afterwards Lord Hamilton of Dalzell who represented this part of the County before the redistribution of seats. While in Wishaw. Mr Hudspith attended the Wishaw Established Church, of which the Rev. A Harper is at present the minister. Though Mr Hudspith bad been since 1870, residing in Northumberland, where he had considerable business interests, he add never given up his Wishaw connection, and latterly he and Mr James Riddell were the sole partners of the firm, Messrs Wm. Hudspith & Co., which conducted the Wishaw Fireclay Works and the Carbarns Colliery. As in Wishaw so in his native district Haltwhistle he took a keen interest in public affairs being a member of nearly all the public boards in the locality. Naturally, the removal of Mr Hudspith by death has been deeply felt in Haltwhistle and also in Wishaw. 1903 – Hudspith William & Co, fire clay goods manufacturers & coal masters. Wishaw fire clay works & Carbarns Colliery. TA Hudspith Wishaw. 1910 – Map depicting William Husdpith & Co.
1940 – Map does not show William Husdpith and Co works. These planters are all in good condition, there are some slight chips but this is not uncommon with this material. 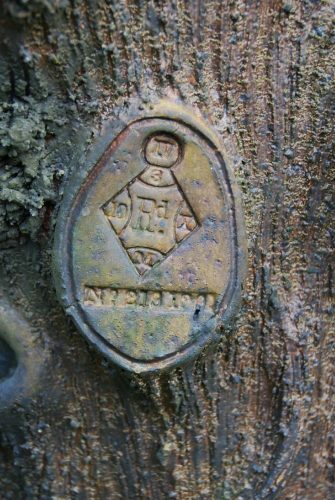 One of the planters is stamped with a Registration Design diamond mark and having researched this I have found that it was produced on 3rd June 1868 by a company in Haltwhistle, Northumberland called W Hudspith South Tyne Works. The photos include the registration mark and also images of the original jardiniere and the Brickworks where made. This company grew from employing 20 workmen in 1861 increasing to 44 by 1881, making bricks, tiles and troughs. The tree stump planters were well known in the area and it appears that it was quite a status symbol to own one and have it displayed in your garden, some of which were in gardens in and around Haltwhistle! 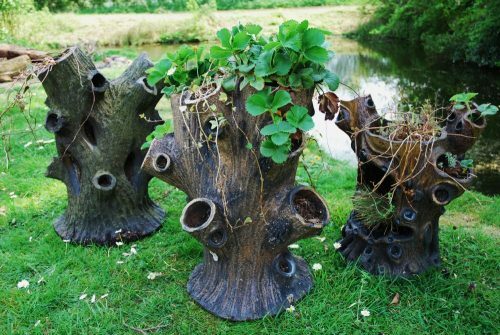 They are great, unusual decorative pieces and can be planted with either strawberry plants or any plant of your choice. 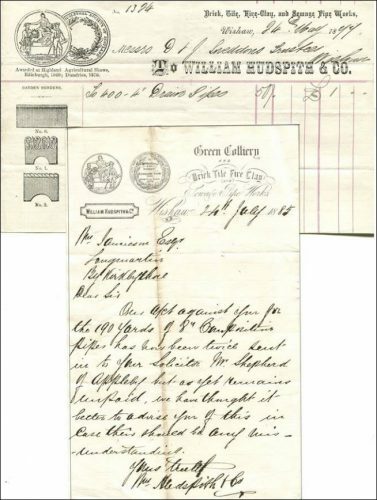 Below – Letterheads from 1885 and 1899 – William Hudspith, Green Colliery, Wishaw. These are not in my possession. 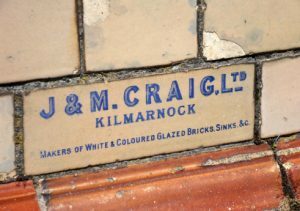 Previous Article Corsehill brick and tile works, Springfield, Dreghorn, Kilmarnock. Next Article Auchinlea, Bellside and Greenhill, Nr Motherwell - The King family dynasty. Found by Andrew Gemmell in the Milngavie area, Glasgow. Wm Hudspith & Co Wishaw, Wishaw Pottery and Brickworks, Wishaw. . . . . In the possession of Ian Suddaby W Hudspith Haltwhistle South Tyne Works trough. This is an interesting trough. Mr W Hudspith Haltwhistle is one of the same as W Hudspith & Co, Wishaw, Motherwell Haltwhistle Burn Brick Works Hudspith links . . ********************************************* Below – link Object: Gnarled tree trunk salt-glazed garden ornament. Text: W…. 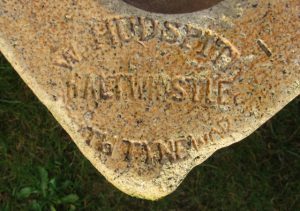 In the possession of Ian Suddaby Animal feed trough W HUDSPITH & CO WISHAW – Wishaw Pottery and Brickworks, Wishaw. . . . In the possession of George Kennedy, Carluke Thos. Dean, brickmaker, Beltonfoot Cottage, Wishaw, Motherwell . . . . This example is in the possession of CulturalNL Museums & Heritage. Thos. Dean, brickmaker, Beltonfoot Cottage, Wishaw, Motherwell. . . . .
Found by Eddie Mclean in the Glasgow area. 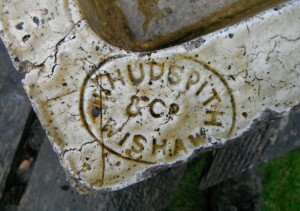 Wm Hudspith & Co Patent Wishaw, Wishaw Pottery and Brickworks, Wishaw. . . . .
Found on the old Hamilton, Braidwood brickworks site,Carluke. Thos. Dean, brickmaker, Beltonfoot Cottage, Wishaw, Motherwell. . . . .